Nathan Cooper in 1825 bought about 4.5 acres of land which included a milldam, sawmill, an old gristmill, and the water wheel for $750. 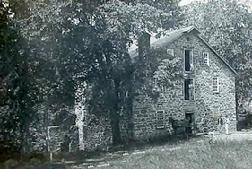 The following year, he replaced the mill with the present stone mill (Cooper Gristmill) and gave the new mill and property to his nephew Nathan A. Cooper. The younger Cooper became a general in the N.J. Cavalry in 1854. He was a wealthy man and also very generous. He had nine children, two of whom died in infancy. Seven of them lived to maturity, and five of those married. To each child upon marriage, he gave a farm or a house. One of these children was Abram to whom he gave the house presently used as the Cooper Mill Visitors Center, adjacent to Cooper Mill on old Route 24 in Chester Township. Abram inherited the mill and considerable property from his father upon the father's death in 1879. The Cooper Mill continued to operate to grind grain into flour until 1913. The Milltown general store, located across the street from the mill, burned down the same year. The children of Milltown (the name that designated the area surrounding the mill) attended a school in which all of the elementary grades were taught in a single room. This one-room schoolhouse, at the foot of Parker Road, was incorporated into the Chester Township Municipal Building in the 1960s. Since there was no water in the schoolhouse, the children had to walk down a hill to one of the Cooper properties on the present State Park Road to get their water from a well. Milltown became a thriving industrial community. Archeological exploration discovered 13 sites tied to water-powered industry and/or local mineral resources. 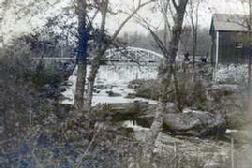 The factors that contributed to this were: the Black River's 20-foot drop within a half-mile...a good incline for water power; a major east-west road...the Washington Turnpike, now part of old NJ Route 24 (County Route 513); a large deposit of iron ore located in the Hacklebarney area; an abundant supply of timber used to make charcoal; and fertile surrounding farmland that supplied adequate produce for running several mills. In addition to the Cooper Mill, there was a second gristmill downstream, a sawmill, a mill to crush apples, one to distill cider into whiskey, and one to process wool. A simple sort of iron mining had occurred in the Hacklebarney area since the 1760s, but increased in importance to the economy of the area from the conclusion of the Civil War until the late 1880s. Chester passed from a predominantly farming community to a bustling and thriving industrial town. An important vein of iron was discovered running behind all of the houses on Main Street and North Road. Other mines opened shortly in other parts of Chester Township. This new industry soon employed hundreds of miners. They had to be housed, so numerous groups of "mining patch" houses sprang up--some on Washington Turnpike, some on State Park Road, all along Maple Avenue in town, and on other streets as well. The rent was $3 per month. The miners worked 10 hours a day, from 7 a.m.--5 p.m., 6 days a week, and earned 75 cents per day. In all of Chester's years of mining, there was only one tragic accident. In August of 1884, eight men were working far back under a sloping wall. Suddenly it broke loose. Only two escaped. The other six were buried under thousands of tons of rock and dirt, including Mr. Zeek, one of the mine foremen. His home was just above Abram Cooper's. A woolen mill was built around 1823, one-third mile downstream from where the Cooper Mill stands today. Mr. Stephen Haines built it for carding (disentangling fibers) and cleaning wool. His partner, Mr. William Nichols, bought the business from Mr. Haines and operated the mill until his death. The business remained in his family throughout the remainder of the 19th century. During the 1880s, the Chardavoynes, Nichols' descendants, leased the mill to Mr. J. T. Shepherd, a carpet weaver. A review of Chester's Centennial celebration in the Morris Journal, published in Dover on February 9, 1899, noted that "Mr. J. T. Shepherd, the carpet weaver at the woolen mill at Milltown, reported that his business was good." Recalling the second decade of the 1900s, Mabel Rockefeller Hoffman noted that Mr. Lancaster now ran the woolen mill, and he bleached old wool white and made it into Navajo-style blankets. Finally, the mill operated as a shoddy mill. Mr. James Hunt would get bales of old material at the Central railroad station (located where the Chester Mall is now at the corner of Route 206 and old Route 24) and process them into small pieces of material to be sold for stuffing mattresses, for making shoulder pads for men's suits, etc. Mr. Hunt ran the mill from 1916 up until World War II. Around 1951 he died, and the mill collapsed a few years later. Only a small portion of the foundation remains today. Although many structures have been long gone, Milltown can once again be re-awakened at the Cooper Mill to the visitor's imagination. In season, the fully functioning gristmill with its guided tours, special programs, photos, exhibits, and artifacts transports visitors of all ages back in time to relive the fascinating and enduring Milltown experience.